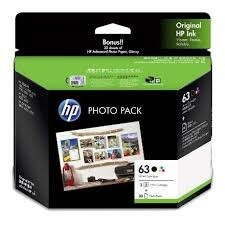 The HP 63 Photo Value Pack Ink Bundle consists of a Black 63 and Colour 63 Cartridge Plus 30 sheets of Advanced Glossy 4" x 6" 250gsm photo paper. For the above HP Inkjet Printers. Yield approx.190 pages black and 165 pages colour.